Louise studied fine art at Cheltenham University before completing an MA in art psychotherapy at Hertfordshire University. She has worked as an art psychotherapist in child, adolescent and adult mental health services for the past fifteen years. She has also trained in EMDR, a form of psychotherapy that is typically used to treat post- traumatic stress. Irreplaceable is Louise’s first book. She now lives on the south coast with her two young sons. 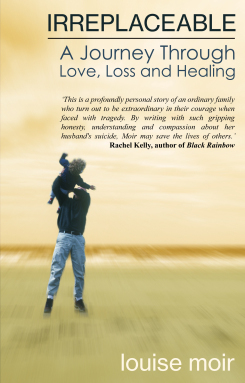 Louise Moir will be discussing her powerful memoir Irreplaceable, which tells the story of her husband’s suicide, on BBC Radio Sussex on 10th and 11th April at 2.30pm. Louise Moir’s powerful new memoir Irreplaceable was serialised this weekend in the Sunday Mirror.